Distilled from essential plant oils, Active+ is an active ingredient that cleanses and protects teeth against bacteria buildup. It relentlessly kills bacteria and eliminates bad breath. Total body wellness starts from the mouth! 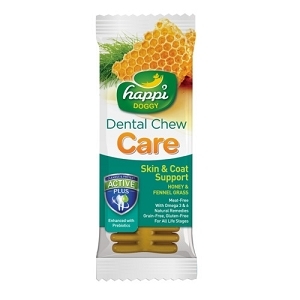 Happi Doggy Dental Chews are proven to clean your canines' teeth by preventing plaque build-up and by removing tartar stains. Each bite presents pleasant surprises. - Be overwhelmed by your dog's fresh breath, healthy pink gum and strong teeth! Afraid of ‘minty’ taste, our Fennel Grass and Honey Chew will definitely be a hit with your doggy! 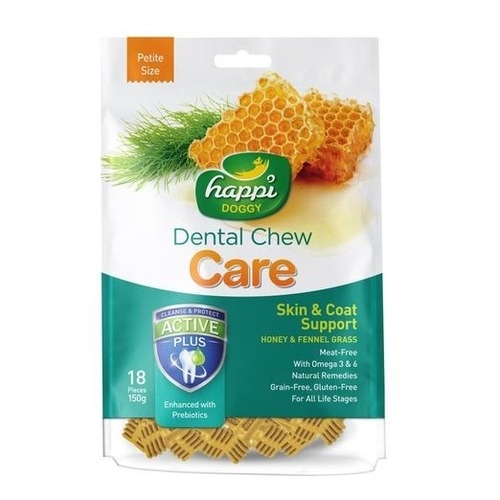 While enjoying the natural sweetness from honey, Happi Doggy® Skin & Coat Support freshens breath by minimizing belching and through its antibacterial activity in the mouth. Rich in vitamins and antioxidants, the Chew also contains live enzymes that are antibacterial, antimicrobial, antiseptic and antifungal. 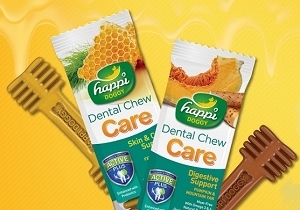 A Skin & Coat Support Dental Chew a day keeps your canine away from indigestion, diarrhoea and allergies. Can your treat keeps coats shiny, skin healthy, assist in wound healing, and repel against fleas and ticks? Rich in antioxidants, fatty acids, and low in calorie, dogs love the taste, owners love the goodness they can see! Honey, Fennel Grass, Wheat Protein Isolate, Flaxseed Oil, Sunflower Oil, Powered Cellulose, Monosodium Phosphate, Natural Vitamin A, Vitamin B3, Vitamin B6, Vitamin B9, Vitamin C, Vitamin E and Vitamin K. Natural Minerals : Calcium, Magnesium, Maganese, Zinc. Crude Protein 52% min, Crude Fats 55% mion, Crude Fiber 0.49% min, Moisture 13% min, Calcium 0.3% min, Total Phosphorus 0.2% max, Ash 1% max. Promo - BUY 6pcs 4" Happi Doggy & Get 1pcs FREE!